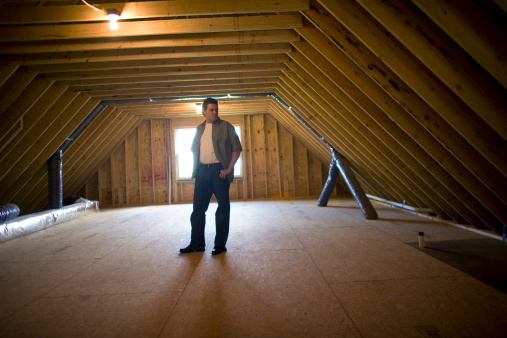 Attics provide the homeowner with another storage area that is typically less damp and dark than a basement. However, attics can also have problems -- such as a musty mold odor -- that are normally associated with basements and cellars. The musty, mold odor can creep down from your attic and take up residence in other areas of your home. The unpleasant odor can also attach itself to items stored in the attic. Attics provide extra space for a spare room or storage. Wear a pair of rubber gloves, safety goggles, a long-sleeved shirt and pants to protect yourself from mold and its spores. Remove mold and mildew from hard surfaces by spraying the mold with white vinegar and scrubbing with a sponge. Check the attic for leaks. A leaky roof could cause excess moisture in your attic. If this is the case, mold and mildew will continue to grow and spread in your attic until the leak is fixed. Examine your attic's insulation for mold growth. If mold is present, cut out and replace the molded installation. Look for dead animals -- such as birds or mice -- that may have become trapped and died in the attic. Remove any dead animals and place them in a garbage bag. Place fans in the attic and allow them to run for several hours. The fans will help circulate the air and reduce the musty mold smell. Place several boxes of opened baking soda around the attic. Baking soda is an all-natural deodorizer that will absorb odors in the air. Alternatively, place bowls filled with white vinegar or charcoal briquettes in the attic. Sprinkle commercial yard and concrete deodorizer granules on the floor of the attic. The granules are recyclable, nontoxic and will remove odors from the attic. Run a dehumidifier in the attic. Dehumidifiers remove the moisture from the air; without moisture, mold cannot grow. Using a dehumidifier regularly will reduce the amount of mold spores in the air.